FREE PATTERN || BUCKET BASKET TOTE PATTERN! 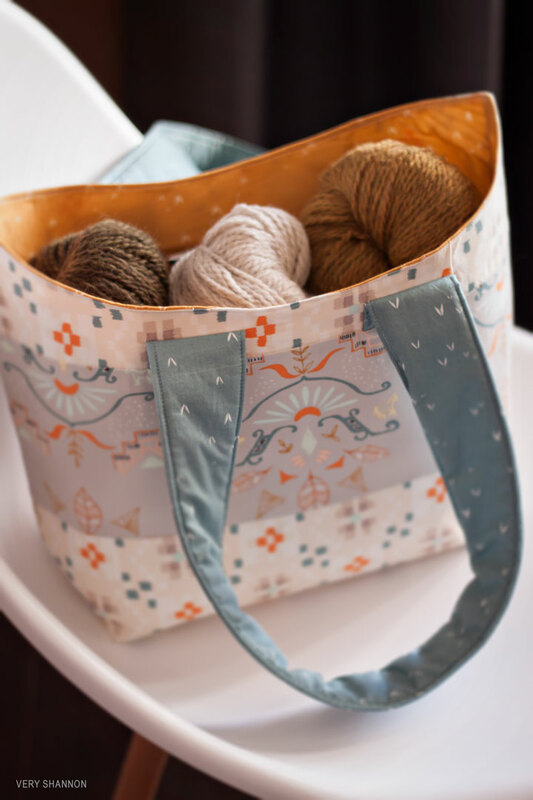 The FREE Bucket Basket Tote Sewing Pattern is here!!! I'm addicted to totes, baskets, project bags & more! Pretty much if I can put my latest knitting project in it and bring it around with me I'm addicted to it. I can never have enough. One of my favorite things to store my wip's in and misc yarn is my African Basket. I was lucky enough to pick up my basket from Tolt Yarn & Wool Shop last spring and I adore it. I've been on the hunt since then for the same style but in a shopping tote size. Well I finally got tired of looking around to buy with no success that I decided to design a tote that's inspired by the shape of the African Shopper Tote. I just knew when I spotted the new fabric lineWanderer by the oh so amazing April Rhodes forArt Gallery Fabrics, that it was the PERFECT fabric for my new Bucket Basket Tote! I loved the tribal vibe and the color palette! So I'm more than thrilled to be a part of April's fabric tour for Wanderer today! All the prints I used were from the Air palette. I used Serape-Dream, Sacred Seeds Brittle, Temple of Asiaq, Crochetting Clouds, Gust of Leaves Silver and Sacred Seeds Mojave. So pick out your fave Wanderer prints to feature and get sewing your very own Bucket Basket Tote! It's easy, fun to make and such a cute tote! It fits infinite amounts of goodies and features a pocket inside. There's not too many bells on whistles on this tote as I wanted to keep the shape of the Bucket Basket the star of the bag. I also wanted to let you have some fun with customizing it as you go! I'm dreaming of versions of this quilted, with piecing in the mid portion, embroidery etc. I was dying to make my straps out of leather but I just couldn't get my hands on leather straps in time for the pattern release. I hope to do one in the future though. I'd like to do the bag in some faux leather mixed in with a fun print! See....so many options! You know how I love that and I hope you all do too! Get your copy of the FREE Bucket Basket Tote Pattern! You can choose to either download the pattern from our pattern shop at VeryShannon.com or via Google Docs. *Remember to always print straight from Adobe Reader - not from your browser, Google Docs or if on a Mac in preview mode. *Please note you will be asked for payment information. This is just part of the cart process. It does not store your payment information and nor will you be charged. The pattern is free. *Please note if getting from Google Drive make sure to download the file first and then print from Adobe Reader - not from direct from google drive or the picture quality/sizing can be wrong. I hope you enjoy our Bucket Basket Tote pattern! Be sure to share your projects on social media with #BBTOTE so I can see all your lovely bags!! Happy sewing! WOULD YOU LIKE TO WIN SOME WANDERER? If you would like to win a HUGE giveaway of WANDERER pop over to April's Instagram feed and follow her (@aprilrhodes) and regram any of the Wanderer Tour photos with #wanderertourgiveaway and she'll choose a winner on March 1st of 20 half yard cuts! That equals 10yds of fabric peeps!! DON'T MISS THE REST OF THE TOUR!